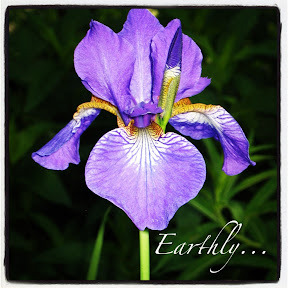 I love purple iris flowers. Maybe it's because it reminds me that spring is coming. These were one of the first flowers to bloom each year, in front of my parents' farmhouse. Some how, this flower helps me remember that God created the world - and he created me. He renews life each spring - physically, through the flowers, animals and other pieces of the world; and spiritually through the lenten journey. I really think this message of renewal and refining is something I'm supposed to be receiving on this journey to Easter. So Earthly is to Spring Flowers is is to Renewal. Sometimes, I just have to go with the crazy way my brain associates one word to another. Frankly, I simply think it's a way God talks to me.